Some of the more common reasons for backup failures include unintentional formatting of a hard drive, accidental data deletion, malware or virus attack, firmware corruption, natural disasters, logical errors and continued computer operation when the hard drive is starting to fail. 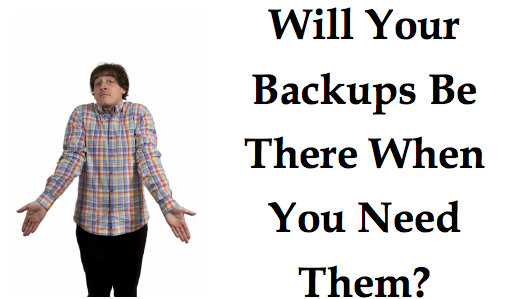 So how certain are you that your backup system is 100% reliable? Could a false sense of security be preventing you from taking actions that will insure your backups will really be there when you need them? Unless your team has all the time and expertise required to consistently close all open loops in your backup system, your organization may be at risk of serious harm due to data loss. We strongly recommend that you let us perform a Backup Audit for you as soon as possible. Contact us today at or info@wirelessiqllc.com to schedule this highly valuable free service – before disaster strikes.